I built the cabins, in their own secure garden as the kind of place I would be happy to leave my boys, as I found most Catteries too small, and none with outside space. Their Cabin is large and set within its own secure garden, where they can climb trees, sit on ledges, watching the wildlife, or me working in my garden. Up to date vaccinations are required, along with worm and flea treatment up to date. Absolutely amazing accommodation - home from home for your pet. My boy never goes anywhere else now and I trust Eileen implicitly - each cat gets special attention and is never left for long without attention. She treat's them all like her own and is a totally dedicated Cat Lover. 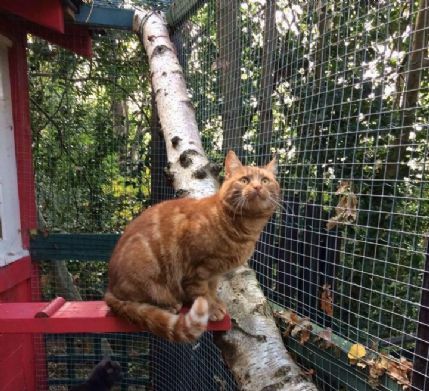 I will never use a standard cattery again - each cabin has outside space to allow the residents to watch all the wildlife in the very interesting garden. The resident squirrels keep my lad very happy and amused. It's local to me but it's definitely the best and I have used the No. 1 Cattery in the UK before to board my cat - her services far outweigh what was offered there.